These 13 familiar poems memorized so easily in kindergarten can have a lifelong effect on children’s imaginations. Christina Rossetti’s “Who Has Seen the Wind?” leaves the indelible image of trees bowing down their heads. And what child won’t love and remember “the friendly cow all red and white” as described by Robert Louis Stevenson? The 13 poems are displayed on 12" x 15.5" flashcards. Each card features a full-color illustration on the front with a smaller version of the picture on the back paired with the words of the poem. Use the “Enjoying the Poem” sections to the right of each poem to prompt your students to think about the poem as they memorize it. 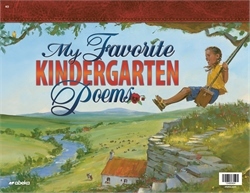 The colorful illustrations on the front will help your students to imagine, enjoy, and remember the poems. 13 cards. K5.